SUMMARY: Tortured German fighter ace Lt. Siegfried Krämer has a terrible secret which could ruin him: he prefers men. Hurried, loveless encounters have armed him with a sardonic wit and a bleak outlook, and he faces a life in which his only companion is his dog, Eike. 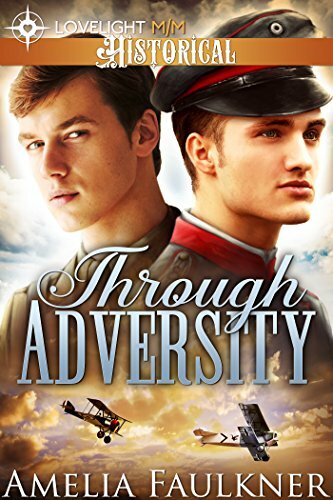 Through Adversity is a historical romance that tells the story of a British pilot and a German pilot falling in love. It’s the kind of forbidden romance that we can all get on board with, so I was eager to read this story. All together I was really happy with the book, but there were still some points that I think could have used some work. The beginning was slow and it almost turned me away from the story. It took about three chapters for me to really grow invested. As soon as Valentine and Siegfried met, though, I felt an instant chemistry and was pulled in. While Valentine and Siegfried interacted naturally, some of the conversations Val and Siegfried had with others around them felt artificial and forced. I was pulled in once we into the meat of the story, when Valentine and Siegfried have to trek across the countryside, not sure where they are, and slowly falling in love. It only took me a couple days to read the book. The nice thing was that when I did set it down (not because I was bored, but because life interrupted or I had to go to bed), it was easy to pick back up where I left, as if I’d never even set it down. Ms. Faulkner crafted wonderful characters. There was an authenticity to Valentine and Siegfried that a lot of m/m novels lack. They were human. It was refreshing to read about two male characters falling in love and neither being pigeonholed into an “Alpha Male” status. They reacted to their situation appropriately and their romance felt real. Watching it unfold was heartbreaking, because you knew that things wouldn’t end well, but you hoped they would get their happy ending. Ms. Faulkner’s style is gorgeous. She weaves in the descriptions beautifully so that you feel as if you’re stuck in the French countryside right along with Val and Siegfried. My only other issue was that I wanted more at the ending. While it was touching and had me choking a bit, I really wished that the story had an extra fifty pages where she expanded on Val and Siegfried’s separation. I wanted to hurt while reading this. I wanted to feel their pining and the distance, and I wanted to see them suffer because of it. I feel a little cheated that we didn’t get this moment, especially after the great build up of their relationship. It would have made the reunion (which was so sweet) much more emotional. I went back and forth on how I should rate this one by about ½ a star. While Through Adversity has some faults and parts that could use work, for the most part the story was engaging and beautiful, and I thoroughly enjoyed it. In the end I settled on four stars, because despite some cons, all together this was a very entertaining read and I would recommend it to other readers. So I haven’t done an original post in a little while. I have a few things in the works, including some reviews, but I thought I’d do a little bit of a haul. Now I originally was going to record it, but due to some rather annoying technical difficulties, I gave up. I’ll have to work on that, because I’d like to also start doing live reviews, which would be a little more in depth on my opinions. 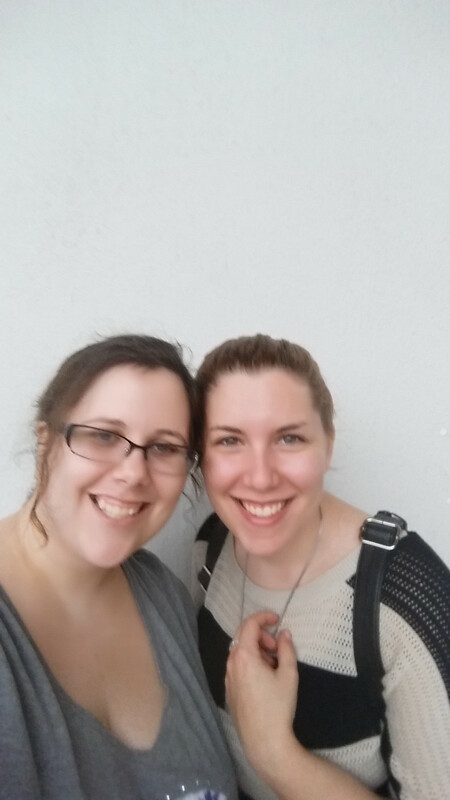 I’ll keep you up to date on where that is, but right now it’s in li~imbo! 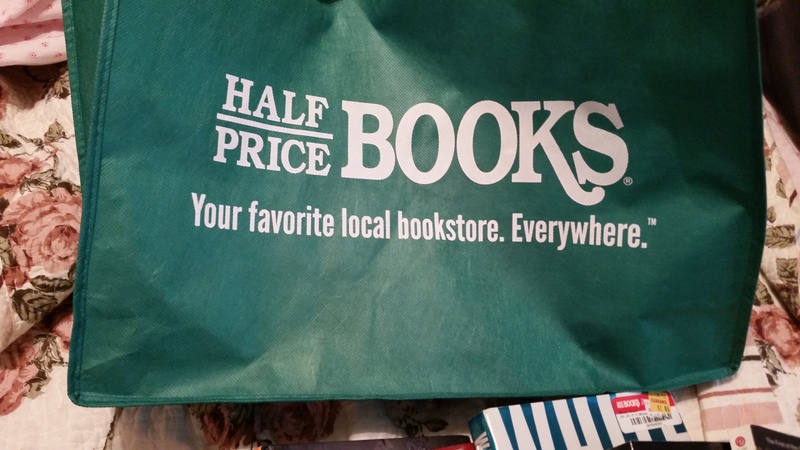 This past Saturday was the annual Half-Price Clearance Sale, where all the local Half-Price Book stores in the central Ohio area come together and set their clearance items. Everything is $2 or less. On Sunday it drops down to a $1. It’s a three day extravaganza of books upon books. And I mean this was an entire building down at the Ohio Expo Center filled with rows upon rows of tables, covered in books. It was huge! It started at 9, but I got there early with Dahmpir72. We were there around 8:30 and there was already a line. It was crazy! The line grew as we waited, starting to wrap around into the parking lot. The reason we got there early was to get some exclusive totes. This is my Black Friday, y’all. It was crazy, but fun. When the doors opened, we rushed in. It didn’t take long for the carts to vanish. I won’t go into detail, but needless to say we left about a quarter till noon and we still hadn’t even put a dent in the place. I managed to keep within my $20 budget, which I’m proud of. This is the back. I thought it was super cute! I made out like a bandit. 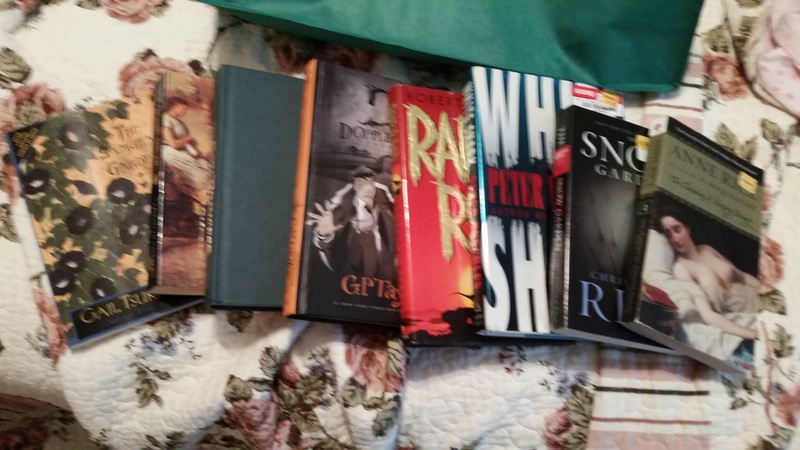 I got some really great books. Some of them I read, some of them I never even heard of, and a couple I’ve been searching for for a really long time! The first book I got was THE SAMURAI’S GARDEN by Gail Tsukiyama. I’ve already read it, but it’s one of my favorites from her so it was a must have. Dhampir72 actually found a copy as well (hers is with the newer cover). I then got NORTH AND SOUTH by Elizabeth Gaskell. You do not even know how long I’ve been looking for this book. I’ve been hunting for it for over a year, ever since I saw the Richard Armitage mini series from BBC. It’s sooooooo good. If you like period pieces, especially Regency/Victorian era ones, this is right up your ally. The third book, which as you can see has no dust jacket, is an intermediate grade story called THE SPY PRINCESS. I thought it looked super cute, so I figured I’d give it a try. I got another intermediate grade novel called The Doppleganger: The Great Escape. It’s a comic/novel duo and it seemed super cute. I’ll post reviews when I finishr eading. The 5th book I found made me laugh and was an instant by. It’s called Raptor Red by Robert Bakker. And you guessed it, it’s about raptors. I couldn’t find a better book to read after seeing Jurassic World, than Jurassic Park its self. I got another creature book. This one is by the writer of Jaws, and it’s called WHITE SHARK. I looooove creature/monster books. I think they’re so fun. They always remind me of bad Sy-Fy movies. I picked up a copy of THE SNOW GARDEN by Christopher Rice. He’s one of my all time favorite authors, and I’ve alraedy read this one. I just didn’t have a copy of my own. I’m slowly collecting all his books. Then of course, the final book I got, was Anne Rice’s THE CLAIMING OF SLEEPING BEAUTY. I’ve been dying to read this series, so when I saw it for $2 I couldn’t resist. Well that’s it. That’s all I got. Not a bad deal for under $20. They do these sales all over the US. 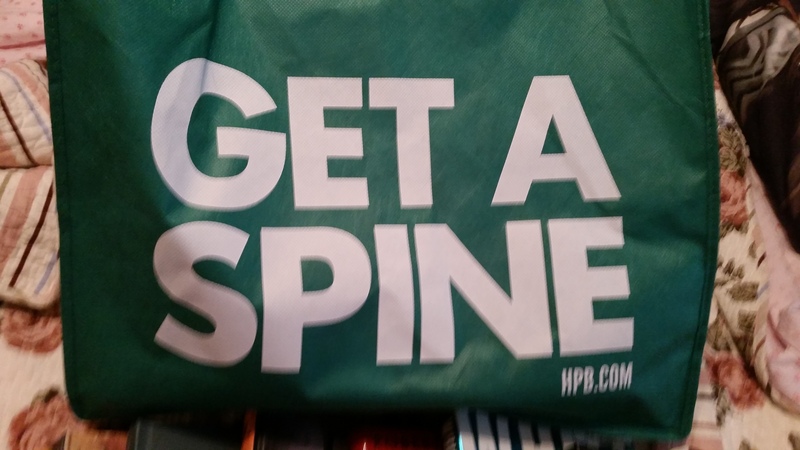 So talk to your local Half-Price store to see when yours is. I recommend going, because you never know what treasure you’ll find!